Purple Fountain Grass is a deciduous perennial grass. It forms tufts that reach 3 feet tall and 18 inches wide. In climates that have occasional freezes this grass is used in the landscape as an annual. Pennisetum setaceum ‘Rubrum’ has rough stems with long, narrow, bronze leaf blades. From mid-summer to early autumn this Pennisetum bears pink to purplish pink spikelets that are plumed and bristled seed heads that nod. 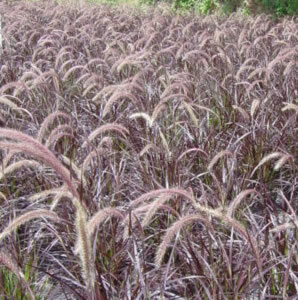 Purple Fountain Grass is great for use in mixed perennial beds, mass plantings, as well as in mixed containers.